Hello and Happy Happy Hump Day! It's been a super busy week for me and although I was tired and dreading making a card after work today, I somehow found some motivation and was super happy with it! Here's the PCC sketch and of course it's a super easy one which is always good! 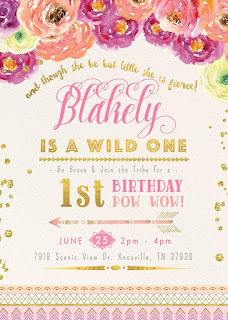 I love the tribal print on the bottom of the invitation so I pulled out my brand new Hero Arts Tribal Stripes Bold Prints Background Stamp.. here's what I came up with..
For the background I inked up a small section of my stamp with Tim Holtz Peacock Feathers and Picked Raspberry distress inks and then spritzed the stamp with water. I placed a piece of 4" x 5 1/4" Watercolor Paper onto the stamp and then pulled it off and let it air dry. I added a piece of FSJ Natural thread and tied it into a bow on the far left side. 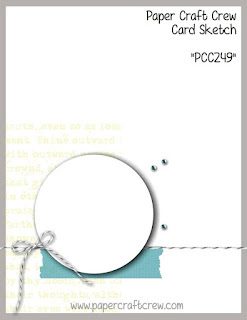 I then added this to an 11" x 4 1/4" piece of SU Tempting Turquoise Cardstock that was scored at 5 1/2" for a top folding card. 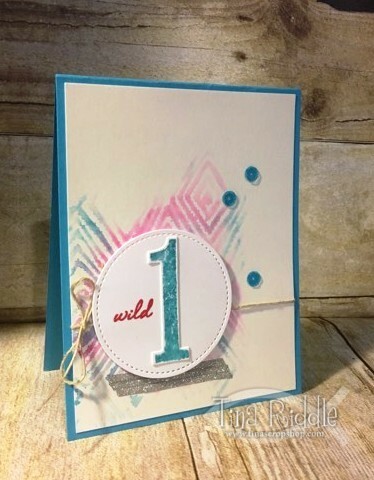 I stamped the "1" from SU Number of Years Stamp Set in Tempting Turquoise and cut it out with the matching framelits. I stamped the "wild" from the Hero Arts Color Layering Bengal Tigers Stamp Set in SU Melon Mambo on a circle that was cut from Neenah Classic Crest Solar White 80# cardstock with the SU Stitched Shapes Dies. I attached it with foam squares. I added three Doodlebug Sequins and three strips of silver thin glitter washi tape to finish this one off. I think it turned out super cute! SIP Challenge #103 Sketch Challenge!